Conference season is in full swing, and even I can feel it as I put the finishing touches on this post from United Airlines seat 26F, on my way to a conference. It’s an exciting time of year, as these events establish new connections, solidify existing ones, create sales opportunities, and marry the online and offline world. 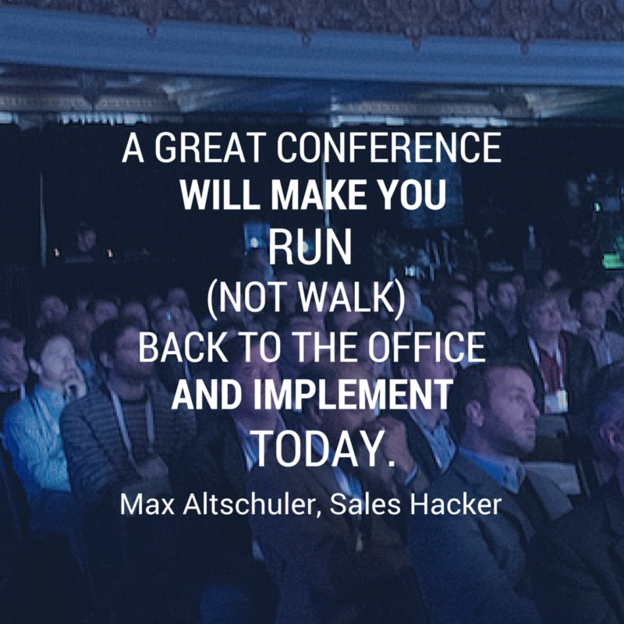 One person who clearly understands the opportunities of conferences is Max Altschuler, creator of Sales Hacker, a fast-growing, popular sales conference touring the globe. Between conferences, I had a chance to sit down with Max and ask him a few questions about how conference attendees, especially salespeople, can make the most of their time while on the conference floor. Thanks for your time today, Max. Before we dive in, why is it important for salespeople to leverage conferences and events? Max: We are living in an era that is constantly evolving and enhancing. We used to sell face-to-face and on the phone, then we added email, and now there is the opportunity to optimize all of those different communication methods, and access data that is cheaper, and more accessible, than ever before. Over the past two or three years, sales has advanced, so it’s extremely important for salespeople to learn how to leverage technology in sales today. Sales events and conferences are now showcasing ways to use technology in the sales process, and embrace the era that we’re in right now. This is the era of sales optimization, automation, and acceleration. Attending events like Sales Hacker is also a great way to connect with like minded peers on the innovative side of sales. Attendees are interested in learning technology, and using it to get ahead of the competition. What are some ways salespeople can get the most out of conferences? Max: Learn who is attending the event beforehand. Email prospects in the city where the conference is taking place, tweet the news that you’re in town, and ask relevant LinkedIn group members if they’ll be at the show. If you can understand who’s going to be there beforehand, you can fill your schedule with key meetings, dinners, drinks, etc. Facilitate those face-to-face meetings, which can accelerate the deal cycle considerably. During the event, meet as many people as possible. Small talk is good, but get to the meat of the conversation quickly, so you can achieve your goals. At the same time, know how to exit or expedite a conversation without leaving a bad impression. After the event, follow up online or by phone, in order to establish a rapport going forward. What should salespeople look for when trying to choose a conference? What are some features of great shows? Max: A conference should present content that is super tactical and actionable. Everything that we talk about at Sales Hacker is actually being done at rapidly growing tech companies right now, by the person who’s actually speaking about it. One of my favorite presentations was from Sam Blonde, VP of Sales at Zenefits, a fast-growth SaaS company. He was the first VP of Sales since their very beginning, and he did a presentation on how he went from zero to 100 reps in under a year, which is pretty amazing. He provided actionable nuggets that attendees could take away and use within their organizations. So, when you look at the Sales Hacker lineup coming up in New York, and likely the same is true for other shows, there are a lot of young, fast-growing organizations attending. They’re nimble, hungry, some have budget, and they’re growing, or ready to grow…fast. Therefore, content is a key driver. The content should educate and excite attendees. It should make them want to run (not walk) back to the office, and implement their learnings today. Another important aspect of a great conference is a high quality group of attendees. The energy feeds off of the audience, and it’s exciting to have a room full of forward-thinking salespeople – from startups to enterprise – looking to grow. They come to enhance their sales skills, fine tune their processes, recruit candidates, sell, etc. A great sales conference puts you in the right place, at the right time, with the right people. Which speakers inspire your at conferences? Who do aspire to be in the world of sales? Max: In sales, Mark Roberge and Aaron Ross are real inspirations. I was an entrepreneur first before I got into sales, so I look at Jason Lemkin, Ryan Buckley, Kyle Porter, Matt Ellsworth, Tawheed Kader, and Zander Ford. These people share their wealth of information. They are inspirations, and supported me early on with Sales Hacker. Get more sales tips in the RingLead ebook, Sphere of Influence Selling: An Inside Sales Approach to Crushing Your Quota.